Stocks in Canada’s biggest cannabis companies have skyrocketed in the past year – with the three largest rising by more than 200 percent each. But analysts are warning the high times won’t last as the nascent legal weed sector seems to be heading towards a bubble. The combined market capitalization — the value of a company’s individual stocks multiplied by the number of shares‚ of Canada’s three largest weed firms, Canopy Growth Corp., Aurora Cannabis and Aphira Inc., topped $14.5 billion at the end of 2017. It’s an impressive feat for a budding industry that’s only four years old, and is expected to get a major boost when the recreational market opens this year. But the combined revenue of the three largest firms was less than $110 million in that same period, as analysts told VICE News that rapidly rising stock price are unsustainable given the companies’ sales and future prospects. “There is so much hype and overvalue that a lot of investors who get into this now will get taken and robbed,” said Nic Easley, managing partner of Multiverse Capital, a Colorado-based firm investing in cannabis stocks. “People say this is the ‘green frontier’… (but) a lot of Canadian companies realize the space they are in right now is a little over-valued,” Easley told VICE News. Those warnings, however, do not appear to be heeded by hedge funds, former police chiefs, and a host of politically-connected former government officials who are still betting big on the sector, which is still seen by investors as a hot new commodity. Valued at about $6.2 billion, Smiths Falls, Ontario-based Canopy Growth Corp is considered the world’s biggest publicly traded cannabis firm. Its stock surged by 225 percent in 2017, according to company data. Canada’s government believes total expenditures on cannabis will be $5.5 billion in 2018, according to a report released last fall from the Parliamentary Budget Office. Those estimates are in line with predictions from Rob Tétrault, a Portfolio Manager and Senior Vice President who tracks the marijuana market for the National Bank of Canada. And that’s a problem, Tétrault said, given the quick rise of stocks throughout the Canadian cannabis sector. Put simply, he said expected cannabis sales don’t justify the current valuations of marijuana companies. “We’re already seeing the valuation for the entire sector being higher than what we’re forecasting for a mature market,” Tétrault told VICE News. There are more than 70 publicly-traded cannabis companies in Canada vying for a slice of the action. 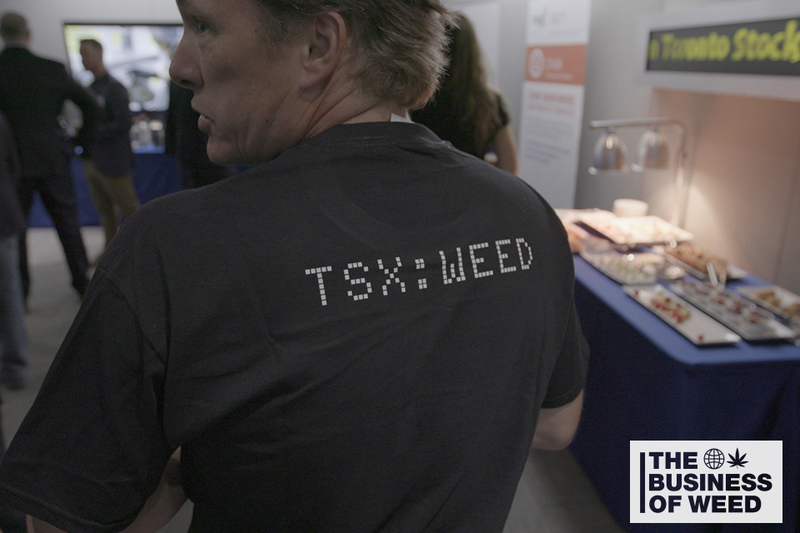 There is nothing odd about investors jumping headfirst into an emerging industry, Tétrault explained, but cautioned that some cannabis stocks are “seeing a bubble” because their shares are already valued as if they are making large profits in a mature industry, rather than companies hoping to capitalize on a growing market with a host of other competitive players. Normally, publicly traded firms are valued at roughly 10 times their earnings, he said. Many Canadian weed firms far exceed these valuations based on their current sales. Canopy Growth, the biggest player, was valued at more than 100 times its revenue in 2017. Aurora Cannabis, the second biggest market participant, was worth more than 200 times its revenue. Companies and their investors are betting on future growth, including exports outside of Canada, to justify current stock prices. But Tétrault and others don’t think Canadians are going to be smoking enough marijuana to make those valuations viable in the long term. The government is predicting an increase in demand following legalization from between 378 and 1,017 metric tons in 2018 to 403 to 1,190 metric tons by 2021, also according to the Parliamentary Budget Office. But these higher consumption rates are still unlikely to make the valuations of cannabis firms sustainable in the medium term, analysts said. Demand will only go so high, according to Tétrault, and other countries like Denmark, Colombia, and South Africa are moving into the legal market, which will undercut some export potential for Canadian-listed firms. Many smaller Canadian cannabis companies are likely to be absorbed into larger players in the next two years, according to Easley, who has tracked the sector for more than a decade. He predicts that some of the bigger firms are going to have trouble justifying their valuations. Some analysts have compared the current bull run in Canadian pot stocks to the ill-fated dot-com boom of the 1990s, where virtually any company related to the internet could command huge valuations from investors despite having minimal sales or profit. That dot-com comparison, however, wouldn’t be exactly accurate, said Tétrault. Internet start-ups can create new value streams: products and services that literally don’t exist today, he said, while cannabis companies have no such luck. Despite the hype and larger-than-life characters like Snoop Dog puffing on joints for publicly traded firms, the underlying business model for cannabis companies has a lot more in common with boring-old-farming than the sort of digital euphoria where a startup like Instagram can be sold for more than billion dollars (and hold that value years later). Growing buds in a greenhouse and then selling them to dispensaries or government-owned stores will not create the next Google or Amazon, Tétrault explained, despite hopes that weed companies will eventually start producing more edibles or pharmaceutical-like products. With inflated price to earnings ratios, high levels of competition and lingering questions about how the sector will be regulated and taxed by government officials, cannabis firms’ high is unlikely to last, said Easley, the Colorado-based analyst. Black market weed could likely continue thriving, especially if provincial governments enact high taxes on the product – something analysts believe is likely as officials develop a taste for the new revenue stream. Internal Finance Ministry briefing notes estimate that every dollar of increased tax on a gram of marijuana will strengthen the black market, which would in turn hurt publicly-traded cannabis firms. “Tax revenue is like heroin to a government,” Easley said. Expected new taxes over will increase costs, dampen consumer demand, and thus hit the valuations of cannabis firms. For investors who want a piece of the action, now isn’t the time for sector-wide exposure, Easley said. Money managers with inside knowledge or investors who have particular insights about the management teams and product of specific firms might fare differently, he said. But he expects many firms will go bust or see their valuations drop significantly in the next two years.